The Guild of the Knoxville Museum of Art (KMA) seeks artists to participate in Artists on Location, April 22 to 27, 2019. Artists working outdoors with oil, pastel, watercolor, and acrylic will have an opportunity capture sites in and around scenic Knoxville, Tennessee. KMA’s Artists on Location event is open to painters, age 21and older. All entrants will be juried by a professional, outside artist. The maximum total number of participants is 30. Application on Juried Art Services is open until March 1, 2019. $2000 in cash prizes will be awarded for 1st, 2nd and 3rd place, awards for best of Landscape and Urban scenes. An Artists Choice will also be awarded. Art will be judged by featured artist M. Camille (Candy) Day. Artists on Location, information and update can be found through the KMA website, www.knoxart.org. 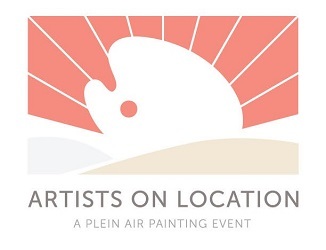 Press release for Artists on Location found in Plein Air magazine, online with Dogwood Arts Festival website and through local/regional Knoxville publications. Social media promotions are through Facebook at Guild of KMA and Instagram #artistslonlocation. Artists will submit 3 digital images of plein air paintings made within the past two years with entry through JAS. Please use a high-quality image and include the name of the painting. Arrange images in the order in which you would like them to be viewed. Images must be JPEG format at 300 ppi and sized from 1900 to 4000 pixels on the longest dimension. Refer to the Help menu on the Juried Art Services site. Images must be in JPEG format and may be used for promotion of the event. Acceptance/ no acceptance Notifications will be sent to each applicant via email no later than March 15, 2019. Artist agreement forms and key information will be emailed to accepted artists following the notification announcement and once payment is secured. A jury fee of $50.00 is due no later than March 1, 2019. Artists who have not paid the $50 entry fee by March 1, 2019 will forfeit entry into the competition. Regretfully, refunds cannot be made. · Artists will bring artwork to the museum on Saturday, April 27, 9 to 11 am for registration. · All art work must have name of painting, location, artist’s name and price. · Artists will declare artwork was produced entirely en plein air with no photographic or technologic assistance with art for Artists on Location. · All artwork for the exhibition must be checked into the KMA no later than NOON on Saturday, April 27. All art must be set by 1 pm. · Artists will provide their own material and transportation to locations. Housing is available upon request. Please contact knoxvillepleinair@gmail.com by March 1, 2019 if you require housing. Housing on a first come first served basis. Deadline for application and payments. Artists on Location in open Artists paint on location for 4 days in and around the Knoxville and Eastern Tennessee area. Art registration check-in and art hanging, open at 9 AM. All artwork must be checked in by noon and ready for juror no later than 1 pm. All works must be original and painted en plein air during the Artists on Location event. Works painted during the event are limited to oil, pastel, acrylic, and watercolor. Artists must submit at least two (2) finished pieces for prize judging. Artists may submit additional pieces created during the event for judging and one (1) studio piece for the exhibition and sale. Studio pieces are exempt from awards. All artwork must fit into a 5 feet wide by 8 feet high space. All works submitted must have the name of painting, location, artist’s name and price. Paintings must all be displayed on the wall; No artwork is permitted to sit on floor. Framed and unframed art works are permitted. However, unframed art must be 1 ½ inch thick edge gallery wrapped canvas and appropriately finished to edges. Artwork must be ready and wired for installation and sale. No saw tooth hangers are permitted. Artists should bring hardware to hang their own artwork. Limited materials will be available to assist with hanging. The KMA opens at noon on Sunday and art work may be allowed to hang until 3 pm April 28 for additional potential sales. ALL work must be removed by 3:00 pm. Any unclaimed art will become the property of the Knoxville Museum of Art. The Knoxville Museum of Art will retain a 40% commission AND artists receive 60% commission of sale price for each piece. Payments for sold artwork and or award money will be sent to the recipient artist 30 days after the event. All artists must submit a completed W-9 form at time of artist check in. This event is a fundraiser for the Knoxville Museum of Art, a 501(c)(3) non-profit, and all proceeds support the KMA’s mission to promote the arts education and community events. Art work donated for this event may be tax deductable. Participating artists and a guest are invited to a private cocktail dinner and plein air painting demonstration on Thursday, April 25, 2019. 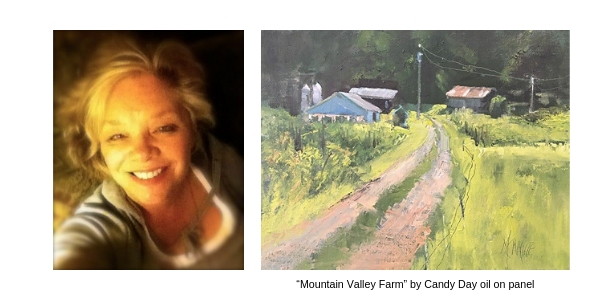 M. Camille “Candy” Day is featured artist and event judge for Artists on Location 2019. The Guild of KMA is honored to have Candy as judge and welcome her to this time honored event in Knoxville.